Mon-Sat West Ham (WH) allocation introduced. RTW class withdrawn in favour of Routemasters. 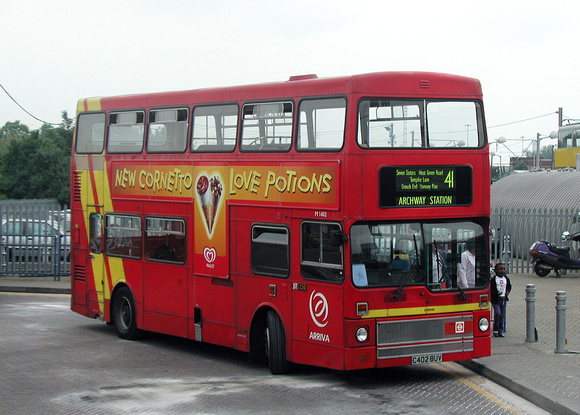 Route 41 became part of the new district" Leaside "
Tottenham (AR) weekend allocation withdrawn. Extended from Archway to Highgate. Withdrawn between Archway and Highgate. Withdrawn between Tottenham Hale and Ferry Lane Estate - replaced by extending W4 from Tottenham Hale instead. ROUTE TRANSFERRED TO MTL London Suburban Buses based at Edmonton Depot. ROUTE TRANSFERRED TO LEASIDE BUSES. Changeover point Plaistow Broadway ? Changeover point Seven Sisters or "The Swan"